What if I can’t move the bed in my treatment room? “I am a new Esthetician and will be working in a spa with a small private treatment room, approximately 10′ x 15′. The bed only fits one way….Feet facing the door. This is a great question and one I often get from my clients. #1 – First make sure to exhaust all other possibilities for your bed or table to live in a different place in your room, away from the door. Oftentimes I find that although you might think the bed may not fit in another area of the room, I encourage you to try to move it to various positions or use a measuring tape to give you the precise details you need to best inform your decision. On the back of your door, hang a beautiful [lightweight] tapestry with an image that is soothing or nurturing to your client or patient while she is on the table. 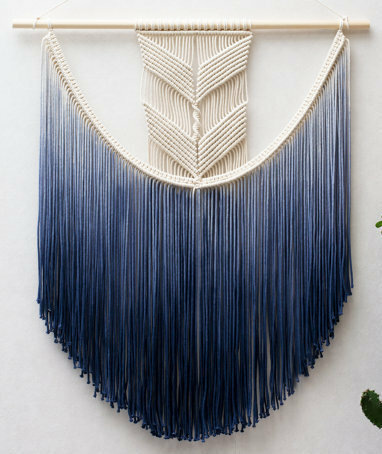 The most appealing part of the wall hanging [shown above] to me is the feminine u-shaped curve. This feminine element helps to balance the rectilinear square and rectangular shapes in the rest of the room. And that is what helps create that perfect cozy vibe you are looking for. In Tina’s situation, by hanging a beautiful tapestry on the back of the door, her client’s mind is distracted from seeing a door and instead she is focused on the art and the how it makes her feel. If a bohemian tapestry is not professional enough [or you don’t like it] for your medical exam room or other wellness treatment room, then hang a modern version of the wall hanging. Most importantly, hang art that has meaning to you and to your patient or client.